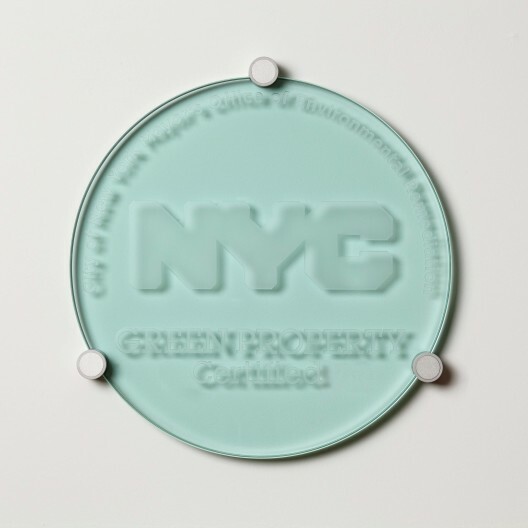 These glass plaques have been sand blasted with the Mayor’s Office of Environmental Remediation - NYC Green Property logo. These plaques feature beautiful depth and shadow as a result of the sand blasting process. This plaque is shown wall-mounted with our brushed aluminum Type B brackets, sold separately. You may also use any of our plaque stands to display the plaque on a table or desktop. Available in three sizes, these plaques may be wall-mounted or displayed with any of our plaque stands. All hardware would be sold separately in the HARDWARE section. Please note that our hardware and plaques are sold separately.